One of Newgate’s handicaps probably reflected the esteem in which the principle of checks and balances was held by New Yorkers in the post-Revolutionary period. Responsibility for the government of the prison was divided among a great number of public officials. Over-all authority was in the hands of a group of seven inspectors and all the justices of the state supreme court. Regulations for the internal management of the institution were made by the inspectors; the justices, or any two of them; the mayor and recorder of New York City; and the state attorney-general and assistant attorney-general. The inspectors appointed an agent, whose primary concern was the financial and industrial operation of the prison, and a principal keeper, who was the chief disciplinary official. The agent was paid twice as much as the principal keeper, but the two men were theoretically independent of one another. This hodge-podge of administrative responsibility was further complicated in 1801 by the creation of a military prison guard under the sole direction of the mayor of New York City. . . . the administrative framework was definitely unwieldy. The anomaly of a prison guard force which was unaccountable to those who carried the main burden of responsibility was particularly irksome to penitentiary officials. . . . .
By 1822. the controversial guard force was still under the direction of the mayor, although the inspectors had gained some authority in making rules for its conduct. . . . The first of the 10 men who served as NYC mayor during the three decades that the State Penitentiary of New York City (aka Newgate) was run in Greenwich Village by a mix of state and city officials was Richard Varick from whom Varick St. takes its name. Varick had owned property on the street that basically is an extension of 7th Ave. 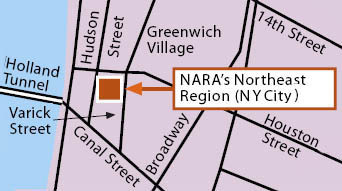 Researchers know 201 Varick St. as the Northeast Regional Archives of National Archives and Records Administration. Click map above for more information on it. Richard Varick, who served Gen. George Washington as private secretary during the Revolutionary War, was later a NYC judge (recorder) and NYS attorney general. As NYS Assembly Speaker, he played a major role in revision of state statutes. 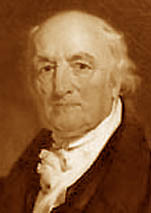 Varick served as mayor 1791 - 1801. The Varick image right is based on one in the National Park Service Museum Collection. Click to access it. Seneca County, between Cayuga and Seneca Lakes in NYS' Finger Lakes region, includes the Town of Varick believed to have taken its name in recognition of his services to the country and the state during and after the Revolutionary War. 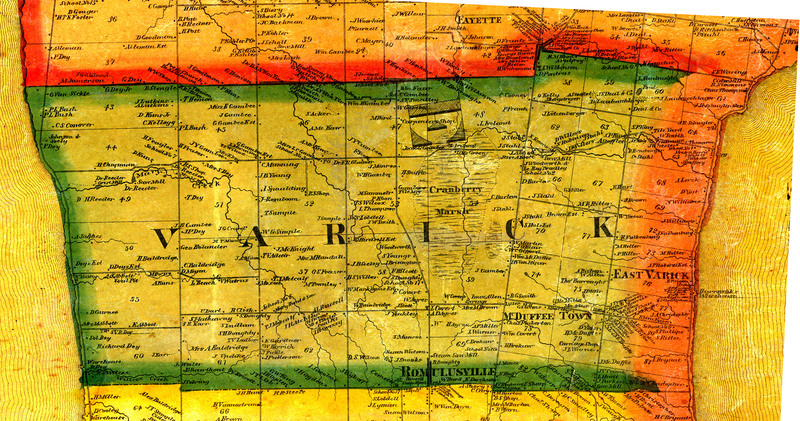 The image below is a smaller version of an 1859 map detail showing Varick Town. Click the image for the full 3.6 Mb image version, one of Bill Hecht's excellent digital scans. Eddy’s resignation in 1804 was but one example of the unsettling influence of partisan forces, for throughout the prison’s history the political pressures which affected staff positions produced undesirable results. . . .
Another obstacle to orderly administration lay in the fact that there were at least four different types of offenders among the inmates at Newgate: adult male felons, female criminals, juvenile delinquents, and the criminally insane. Observers noted frequently and with disapproval the presence of young boys and girls among the convicts. . . .
Good penal care is a costly item, and Newgate’s administrators frequently found legislative appropriations grossly inadequate. This was reflected in the low salaries paid to staff members. An ex-convict [W. A. Coffey] who wrote [Inside Out or an Interior View of the New York State Prison,] an exposé of conditions at the penitentiary in 1823 admitted that some keepers set a good example for the inmates, but alleged that many of them were small-minded, intoxicated with their power, vulgar, and occasionally cruel. On the other hand, he argued, it was hard to expect a capable man to lead the life of a turnkey for $500 per year, especially when he had to stay inside the stockade almost constantly and was permitted to visit his family and friends only once every two weeks. A scarcity of funds prevented Newgate from having an adequate reformatory program despite the efforts of Eddy and those who shared his desire for curative treatment. The limited program it did possess was largely owing to the selfless labors of John Stanford, an elderly clergyman who took part-time duties at the prison about 1807. Edward Livingston (above) was the second man to serve as NYC mayor during Newgate's operation. 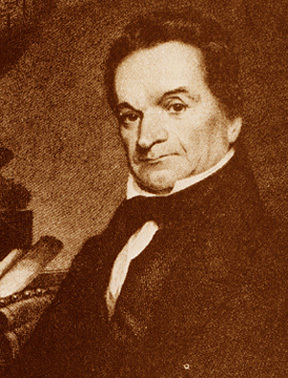 In 1801 Livingston was appointed both U.S. district attorney for the state of New York and NYC mayor, serving in both posts at the same time..During the yellow fever epidemic of 1803, he contracted the disease but survived, only to discover upon return to duties that public funds had been lost due to mismanagement or theft by a deputy. Livingston immediately resigned, sold all his property to reduce the loss, moved to New Orleans where his law earnings enabled him to repay the full balance of the funds lost, plus interest. Beyond the public offices he held, his lasting impact came from his legal writings and law codifications; so much so that some scholars speak of "the spirit of the Livingston code" being remedial, not vindictive. It provided for abolishing capital punishment and for making of penitentiary labor not a punishment but a reward (along with better cell accommodations) for good conduct. 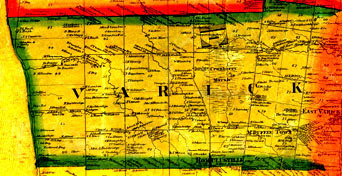 The image above is derived from a Livingston portrait on the National Oceanic and Atmospheric Administration's web site. He was a patron and friend of Ferdinand Rudolph Hassler, founder and first superintendent of the U.S. Coast Survey, a NOAA predecessor agency. Click image to access it. Stanford served for little or no pay and without a definite appointment until 1812, when the legislature formally authorized the institution to have a part-time chaplain. The main burden of his work involved preaching, private exhortation, and visits to the sick and dying. He managed, however, to carry on a series of night classes for the inmates, teaching such subjects as Latin and mathematics in addition to the three R’s. Oral examinations were held before the inspectors whenever Stanford believed the convicts were ready for them. Inmate teachers were used whenever possible. A circulating library was also established, but this was quashed by the inspectors after some of the books were returned soiled, torn, or dog-eared. Stanford suffered another disappointment when the inspectors ordered the abandonment of singing classes he had arranged in an effort to make public worship more meaningful and attractive to the felons. Valuable though his labors were, his part-time status alone prevented him from taking adequate care of Newgate’s needs. 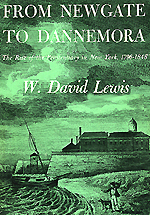 His services were spread thinly, for New York City hired him to be chaplain for the municipal penitentiary, the bridewell, the debtors’ prison, the public almshouse, and the city hospital.
. . . various difficulties [were] encountered by agents who attempted to administer the penal labor system. As a rule, the state furnished all raw materials, supervised all manufacturing processes, and assumed full responsibility for marketing prison-made goods, either in filling custom orders or in displaying products at the prison storehouse for the benefit of prospective buyers. Under this system the agent had many problems. If he did not estimate market conditions correctly he was liable to get caught with a large inventory of merchandise which merely deteriorated in storage. . . .
By the end of 1816, one vexed agent asked the legislature for permission to clear off these stocks at auction for whatever they would bring, or to ship them out “to some southern or foreign port' — in brief, to any place where Newgate would be rid of them. One basic industrial problem stemmed from the substandard talent of most inmate workers. 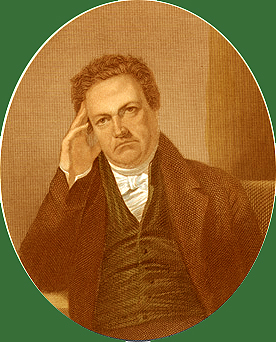 The few capable and experienced hands were likely to be pardoned . . . .
DeWitt Clinton (above) was the third man to serve as NYC mayor during Newgate's operation. He served from 1808 into 1815 with a brief time-out when Jacob Radcliff served 1810-1811. The latter succeeded Clinton in 1815 and served into 1818. Arguably the most important of NYC's early post-Revolution mayors, DeWitt Clinton served 10 terms marked by his promotion of public education, city planning, public sanitation, and relief for the poor. Even while mayor, he also served as state senator and lieutenant governor. Separately he also served as U.S. Senator and NYS governor. He narrowly lost the presidency to James Madison. Known as the "Father of the Erie Canal," DeWitt Clinton throughout his years as governor -- 1817-1823 and 1825-1828 -- pushed building the canal through upstate NY to connect the East with the Midwest. The canal system helped make NYC into America's most important port and NYS truly the Empire State. the year (1822) Auburn Prison workshops were rebuilt. For more on the Erie Canal "fathered" by DeWitt Clinton, visit the extensive presentation on Frank E. Sadowski Jr's ErieCanal.Org website featuring material from the 175th Anniversary Exhibit put together by Union College's Mandeville Gallery in Schenectady. The above Clinton image is based on an engraving that appeared in that canal exhibit courtesy of the Canal Society of NYS. Click it to access its web page source. Some convicts were so old and infirm that they had to be given such relatively unprofitable work as oakum picking, in which old ropes were unraveled and saturated with tar for use in ship-caulking. The shops were also in constant danger of fires set by refractory inmates, and some prisoners deliberately spoiled their work if they thought they could escape detection. . . . Agents were continually harassed by the unsystematic way in which Newgate was supplied with money. Almost from the beginning the state expected it to pay as many of its expenses as possible out of its industrial earnings. If these were insufficient, emergency appropriations could be requested. The prison therefore had no dependable supply of ready cash if sales were slow or business conditions depressed. As early as 1804, the inspectors complained that chronic shortages of money made it impossible for them to buy supplies when they could secure the cheapest rates, and stated that they had already borrowed $4,000 for institutional use on their own private security. In 1811, they again reported that the agent often lacked cash with which to purchase raw materials and other necessities, and asked that he be empowered to borrow up to fifteen or twenty thousand dollars annually from New York City banks. In 1815, the agent protested that he was constantly in debt, and that annual appropriations merely sufficed to pay off the obligations of the preceding year. However bad its financial and industrial problems, Newgate’s greatest difficulty was overcrowding. It had been designed for less than four hundred and fifty inmates, and as New York’s population increased it could not possibly accommodate the large numbers of new convicts who were forced upon it. The situation was met in two ways: by packing prisoners into facilities designed for half their number, and by preserving a rough balance between intake and outgo, if possible, by frequent use of the pardoning power. Both expedients were demoralizing in their effect upon discipline and morale. . . . Bitter and inescapable reality, however, made virtually indiscriminate pardoning a necessity; the unwelcome remedy became an avowed means of keeping the prison population within bounds by approximately 1807-1808. By the end of 1821, when there were actually 817 inmates at Newgate, it was estimated that there would have been over two thousand without the use of clemency. Even so, the institution was still overcrowded. . . . Since almost ten times as many inmates were discharged by pardon as through expiration of sentence, no criminal at Newgate expected to serve out his term. Most commonly, he expected to fulfill about half his sentence. Convicts were outraged if detained beyond this extent, and for some time after the semiannual pardoning seasons the prison was in an unsettled condition. Disappointed felons were unwilling to work and ready to gain revenge upon the state through sabotage. The practice of having regular seasons for the exercise of clemency also resulted in the release of forty or fifty convicts on the same clay, causing mass disruption of the prison industries and a time of intense anxiety for citizens living near the penitentiary. Clever felons attempted to gain medical pardons by resorting to all sorts of ruses. One convict was said to have procured his release from a life sentence after four years by eating a mixture containing Castile soap. in Lewis' book. Nor did the captions. Image sources can be accessed by clicking the red-border images.